The Rheem Prestige Series Air Conditioner featuring the Comfort Control System is designed for maximum efficiency, offering smart technology that helps your family enjoy the highest level of comfort, while lowering energy use and electricity bills. Energy-Efficient Cooling Legendary Scroll® compressor technology delivers proven durability and enhanced efficiencies, providing continuous comfort with less energy usage. Your energy savings are further increased by a cooling efficiency rating of up to 16 SEER. Curb Appeal Low-profile design blends in with the exterior of your home and is less likely to obstruct views from exterior windows. Quiet Performance A compressor sound blanket encompasses the unit’s compressor, greatly reducing operating noise. Low-Cost Maintenance Convenient access to internal components means that contractors can make most adjustments without shutting the entire system down, keeping their time and your cost to a minimum. We understand that purchasing heating and cooling equipment is an investment. With Rheem, it’s one you can expect to continually perform and deliver value for your family long-term. We’ve designed the Rheem Prestige Series to provide comfort you can count on. Protective Design Full metal cabinet protects the coil from hail, lawn debris and keeps curious children safe. Superior Finish Powder-painted metal cabinet finish exceeds the industry 1,000 hour salt-spray testing requirement, guarding against the elements and rust, keeping your investment visually pleasing. 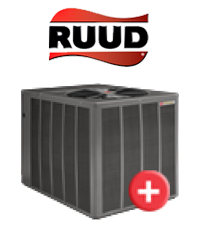 Rheem Quality Complete factory run testing ensures your Rheem equipment operates at peak performance before being installed in your home.